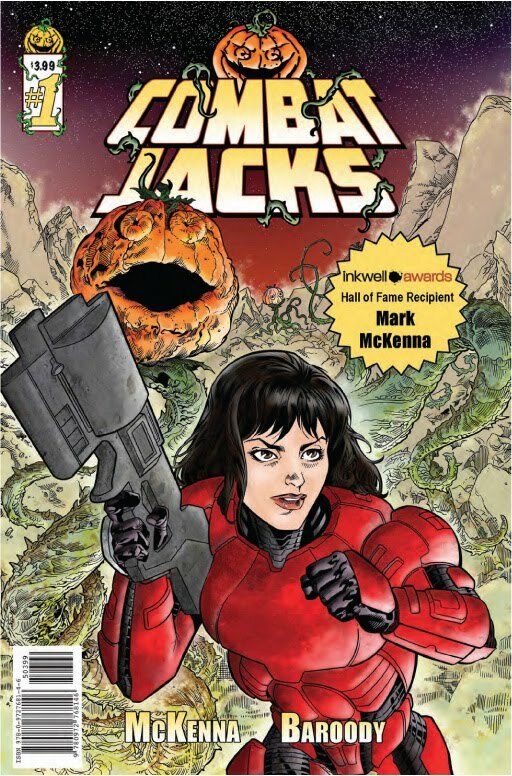 Apparently, Combat Jacks was a project that Mark McKenna crowd-funded recently, but it totally flew under my radar. Which is part of why he asked if I would take a look at it: he realized that he didn't do enough marketing of it earlier and is trying to generate some interest now. McKenna described it originally "as a ONE SHOT sci fi/horror comic in the vein of the old EC Weird Science Fantasy meets Vault of Horror..." The basic premise is that a group of space marines are sent to investigate the mysterious disappearance of a terraforming colony. When they arrive, they run into... well, take a look at the cover there. It reads as something of a cross between Alien and Attack of the Killer Tomatoes with something of an EC-style twist ending. Which sounds absolutely absurd, but it works surprisingly well. Especially given that McKenna did much of the work himself. I've certainly known him as a good inker for many years, but that doesn't always translate to good writing. I have to say, though, he does a good job with both the story and the dialogue here. Penciller Jason Baroody turns in good work here as well; I wasn't familiar with him previously, but the story flows well and he maintains some consistent faces (several of which were based on real people from the crowd-funding). If I were to suggest any improvements, I might point to the coloring. It's not bad, by any means, but it doesn't really add anything to the story. I would've liked to have seen those scenes where the marines are stalking through empty corridors with something more dramatic with the lighting. You know how in Alien all the scenes where they're actually hunting the alien are really dark? That adds to the creepiness factor. It was an actor in a rubber suit, but it scared the pants off the audience because they could barely see the damn thing! I think that type of effect could've been applied by the colorist (I don't see a colorist credit anywhere to name names) and would've made for an even more dramatic story. I mean, if you look at what Marie Severin did on those old EC books, there is some stuff there that's really creepy BECAUSE OF her coloring. Not that the other artists were slacking, of course, but the color really made the stories sing. That said, though, it's a good book and worth a look if you're in the mood for a sci-fi/horror thing. You don't see very many of those on the market these days. The one shot is due out in mid-October (just in time for Halloween) and retails for #3.99. You can ask your local retailer to order a copy (Diamond Code JUL120840) or, I believe, it will be available via the Combat Jacks website around that time as well.